The holiday season is coming, and there are sales to be made. This time of the year brings fierce competition but also plenty of opportunities to capture new customers. Last year, the winter holiday sales brought in $138.4 billion of revenue online. How do you plan on making the most out of will you make them? To help you have your most successful holiday sales season yet, here are some marketing tips to bring some holiday magic around your business. Holiday shoppers know that businesses are competing for customers so they are always on the lookout for discounts and sales. Now is an ideal time to strategize ways to take advantage of the hunter instinct. You could offer a single, valuable discount to draw in bargain hunters or plan a series of short-term promotions that change each week, giving shoppers an incentive to keep on coming back for more. From now on till after the New Year it’s going to get more hectic. Make things easy for your customers. Prepare campaigns with your best gift ideas and include Shop Now buttons that click straight through to the product page. It’s even better if you can offer unique gift suggestions or show ways to bundle more than one product into the perfect gift. Consider offering a discount on your gift bundles too. Memories of childhood and magic, times when the snow was thicker and Santa Claus was real are part of the glow that usually surrenders this time of the year. 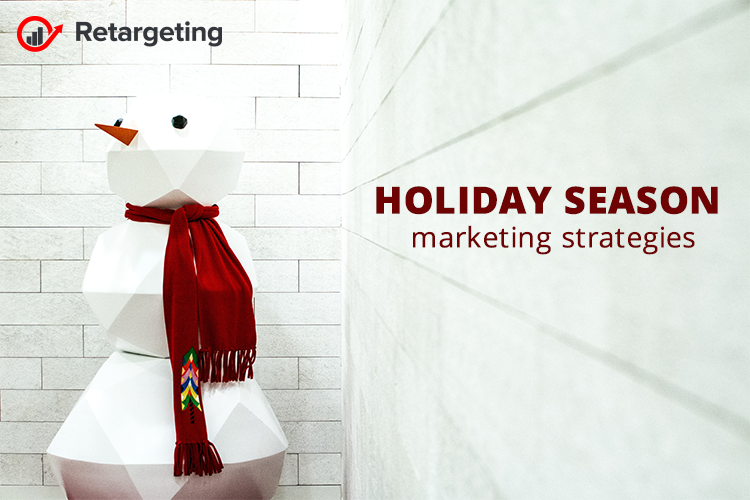 Why not design your holiday marketing campaign to tap into holiday nostalgia? You could use black-and-white pictures, old-style fonts and nostalgic photos from times gone by. Whether you’re planning an in-store display or an online landing page, nostalgia can guide your campaigns this year. All online shops want to attract new customers, but it’s the perfect time of the year to focus more of your marketing efforts on your loyal shoppers. Repeat customers are responsible for at least 40 percent of your sales, so it’s worth it to keep them connected. Take the opportunity to offer a special gift to your best customers, as a special discount. You could also send them handwritten holiday cards, the old-fashioned way. This strategy will get your customers’ attention and show them that you care. In recent years, mobile marketing has become increasingly important for e-commerce. Over $17 billion of sales were made on mobile during the 2016 holiday season and over $35 billion during last season. For the first time, this holiday season mobile sales are predicted to surpass desktop sales. So, it’s vital that your marketing campaigns are mobile friendly and that your online store is optimized for mobile devices. If you have an online shop, free shipping is the best special offer you can possibly present year-round, but it’s especially strong incentive to get more sales this holiday season. Offer free shipping for all holiday purchases and make sure your customers know about it. Feature it in your marketing emails and make sure it’s prominently visible throughout your online store. Consumers aren’t just shopping for gifts, they also want plenty of holiday spirit as well. Give them what they want. Update your homepage and landing pages with warm holiday scenes and plenty of sparkles. You could also offer a holiday gift-wrapping service or a special, limited edition product that’s only available during the holiday season. This type of marketing is on the rise, allowing you to market your brand, not just your products. Consumers love behind-the-scenes videos relating to their favorite brands. So, this holiday season you could show the human face of your company by asking employees to share their favorite holiday memories or giving customers a peek into what’s involved in preparing your business for the holidays. On top of that, a cute or funny holiday marketing video is a great opportunity for non-product-related businesses to tap into the holiday season.